When it comes to sweet decadence, chocolate stands head and shoulders above other candy confections with its delightfully smooth, rich, and creamy sweetness that can only be achieved by using high quality chocolate. Neuhaus has been making luxurious chocolates in Belgium since 1857, and as my mother always says, practice makes perfect. 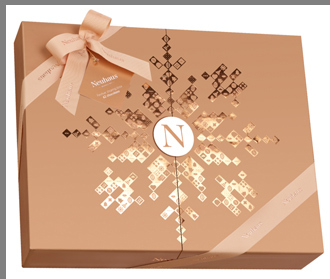 Sumptuous gorgeous gems of chocolate presented in the impressive Neuhaus Holiday Premium Box may be the perfect gift for the chocolate lovers on your gift list. You may want to buy for an extra box or two for yourself though to ensure that the recipients receive their gift boxes fully intact. The story of how Neuhaus chocolates came into existence is quite interesting as it began in 1857 in a pharmacy in Brussels owned by pharmacist Jean Neuhaus. To make pills more palatable for his customers he coated them in chocolate. In 1912 his grandson, Jean Neuhaus, Jr. had an idea to build onto his grandfather's original idea of a candy shell and replaced the pill with a creamy chocolate center. Jean Neuhaus, Jr. named his creation a praline, and it was the first filled chocolate candy. These richly decadent chocolate creations were extremely successful and helped launch many new product innovations for Neuhaus. 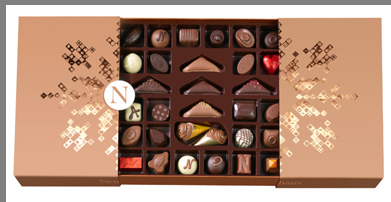 Throughout the years, Neuhaus has established itself as a brand of excellence, and in 2000, Neuhaus was appointed Royal Warrant Holder to the Belgian Royal Court. With its impressive heritage, Neuhaus sets high standards for its chocolates, and is one of the few remaining chocolate companies in Belgium. If you are looking for an impressive gift for someone special on your list, I found the Neuhaus Holiday Premium Box to be perfect. Imagine 62 striking chocolates beautifully presented in a gold box with a snowflake design on the top that slides open from the middle to reveal its sumptuous contents. Tied with a silky gold ribbon proudly bearing the Neuhaus name and a large N decal on the top, it is festively dressed to command attention. Offering a heady assortment of dark, milk, and chocolate fresh cream in a diverse range of shapes, sizes, and flavors, presented on 2 specially designed trays to cradle each exquisite chocolate, there is something to delight all chocolate lovers. As a child, I eagerly looked forward to Christmas and finding a new box of 64-Crayola crayons in my stocking and could not wait to draw with each of them. As an adult, I now look forward to Christmas and the Neuhaus Holiday Premium Box so that I can sample, as well as share, the scrumptious 62-chocolates. Neuhaus also thoughtfully includes a 2-page color booklet with photos of each of the chocolates as well as a description of them to act as a guide book on your chocolate journey as you make your own sweet discoveries. A few of my many favorite chocolates in the Neuhaus Holiday Premium Box include the Cornet Crunchy with Hazelnut gianduja with pieces of hazelnut presented in a gold paper cone, the Désir, a nougatine filled with a dark intense chocolate ganache from Peru, Art Deco 70% - an almond praline with nougat inclusions, the Diane - a chocolate fresh cream on gianduja base with a scripted letter D in dark chocolate, the Caprice - a nougatine filled with smooth Madagascar vanilla fresh cream, the Millénaire - a praline with crisped rice embellished with chocolate stripes, and the 1857, a praline with speculoos. Priced at $129 for the 62-piece Neuhaus Holiday Premium Box, it makes an elegant statement as a thoughtful gift for someone special as well as for corporate gifts. Neuhaus chocolates are available for purchase online, in sales outlets in 50 countries, as well as in stores in the United States in Alabama, California, Hawaii, Massachusetts, New Jersey, NewYork, Virginia, and Washington, D.C.
Visit their website for store addresses and for additional information: www.NeuhausChocolate.com. © November 2017. Luxury Experience.www.LuxuryExperience.com All rights reserved.